If your kids (and/or spouse) aren’t big fans of classic coleslaw recipes, this tasty new twist may help them to actually enjoy the health benefits of cabbage! That’s because the shredded cabbage is tempered with some sweet additions that downplay the cabbage flavor and increase the yum-factor! 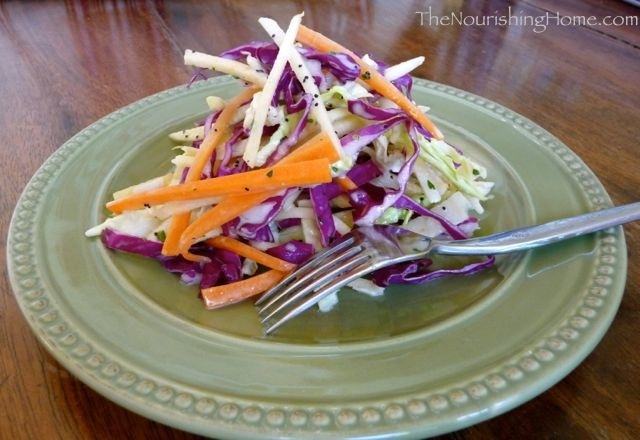 By adding thinly sliced apples and carrots to the mix and tossing it all together with a creamy poppy dressing, you create a sweet-n-tangy slaw with a delicious burst of crunchy flavor in every bite! Not sure how to shred a cabbage? This quick 40-second “how to cut cabbage clip” shows you just how fast and easy it is to shred a cabbage, lest you’re tempted to pay more for a bag of pre-shredded cabbage. (Place any leftover cabbage in an airtight container in your frig for use in tacos, soups, salads and more.) In fact, once you’ve mastered coleslaw, maybe you’ll be up for a new adventure … making your own cultured sauerkraut. Remember to utilize “mise en place” for quicker, easier and more successful results! Yum! In a small bowl, whisk all "the dressing" ingredients together until well blended. Set aside. Shred the cabbage, rinse and dry thoroughly. (I like to use a salad spinner for this task, but you can also place the drained cabbage on a kitchen towel and pat off excess moisture.) Place in a large bowl; set aside. Julienne the apples and carrots, and finely dice the onion and fresh parsley. Add to bowl of shredded cabbage. Whisk the dressing again to recombine ingredients and then drizzle the dressing over the slaw and toss well to combine. Serve immediately, or store in fridge for up to two days. 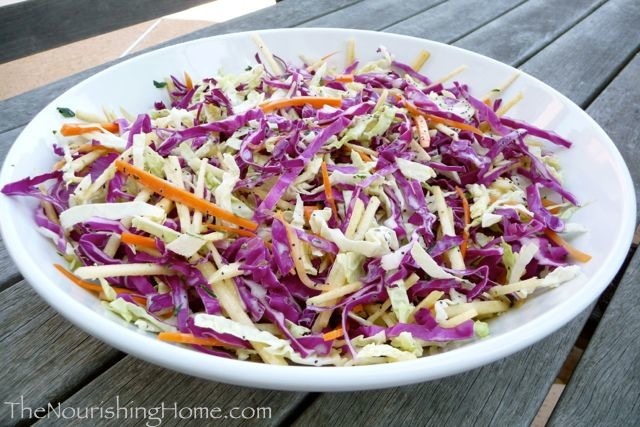 Just be sure to toss the coleslaw again, prior to serving, to evenly distribute the dressing throughout the slaw. Whole30 Variation: A compliant way to add sweetness to this slaw while on whole30 is to add 2-3 tablespoons of unsweetened apple juice (or apple cider) to the slaw dressing instead of honey. Time-Saving Tip: Cut the cabbage up to three days prior and store in an airtight container in your frig until you’re ready to make the slaw. You can also make the dressing 2-3 days prior. In addition, you can julienne the carrots ahead of time, just be sure to store them in an airtight container so they don’t dry out. However, I don’t recommend cutting the apples ahead of time, as browning will occur. 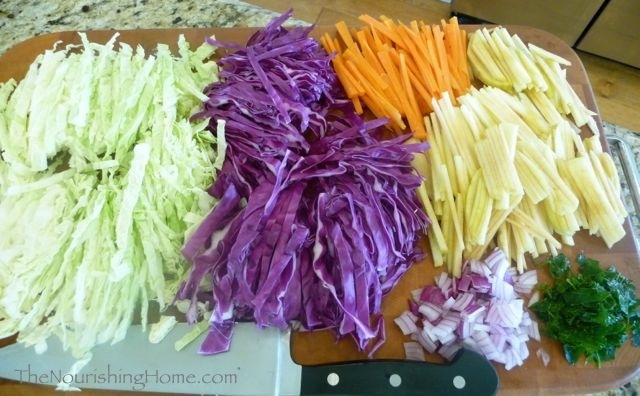 What a gorgeous looking slaw! those colors! and i bet its just fabulous with the apple! i’m so glad i found your blog! thanks for sharing! This looks yummy! I love the idea of adding apple to coleslaw…I will definitely be trying it. You have a lovely blog! This recipe looks so fresh and tasty. We have a lot of cabbage heads producing in the garden this year, both green and purple. 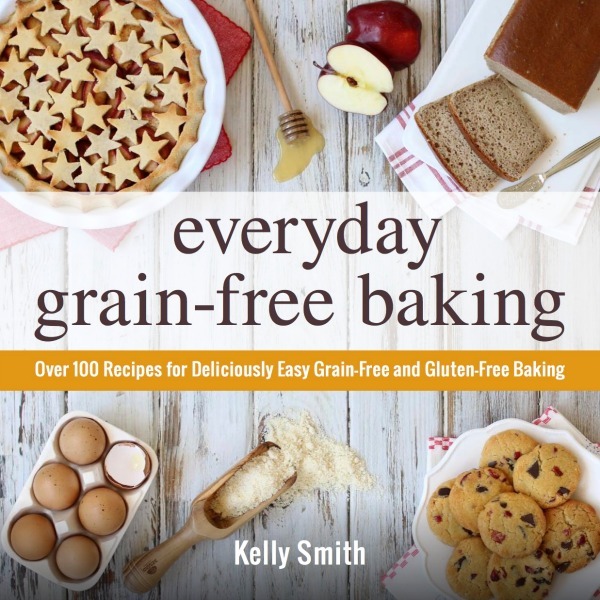 This will be a great recipe to try out! I will have to substitute coconut yogurt and vegan mayo, but everything else is pretty much gluten and allergy free ☺ I would love to invite you to share in our recipe hop this week. It will be open until midnight Wed. and is a weekly event beginning on Sunday at 7pm. I sure hope to see you there ☺ Oh, and I’m visiting from the Homestead hop. I love your recipe for the dressing!!! This looks great Kelly! We’re huge coleslaw fans and I love your twist on it with the apple! Thanks for sharing this with Summer Salad Sundays, look forward to seeing you again soon. Kelly, today I made the last dinner recipe of your meal plan that I started last week. Everything has been delicious and my husband is grateful for having healthier home-cooked meals (rather than our go to boxed Mac n cheese, hamburger helper, or rice, meat and asparagus.) He’s been trying a lot more variety and I’ve been getting the variety I’ve always craved. Since it’s just the 2 of us and a toddler who barely eats, we’ve been having lots of leftovers, which means I think I could stretch 1 meal plan to 2 weeks. For this recipe, I ran out of carrots (used them for your bone broth last night) but had some sweet baby peppers that were going to waste in my fridge. I julienned those and tossed them in and it still turned out great! The best part, as I was chopping the ingredients, my son helped himself to about half an apple and an entire mini bell pepper! (I used to give him pieces and he’d chew it, then spit it out.) I think seeing us eat all this healthy stuff is helping him expand his horizons as well! Thanks for all the great recipes and tips! Hi, Jennifer. You can omit the mayo and use additional coconut cream, or you could blend the coconut cream with half of an avocado so you get the creaminess that mayo imparts. 🙂 Happy Whole30-ing! Hi, during Whole30 is allowed to use coconut milk? I am starting today. And I am stull reading all can and cannot…i remered to read that dairy is not on the list? Hi, Ana. Yes, coconut milk is compliant. If you join my Whole30 community, I send you quick links on Whole30 so it makes it easier to follow, and I provide weekly whole30-compliant meal plans. 🙂 You can join us here, if you’d like: http://eepurl.com/c04Dvb Hope you have a wonderful Whole30!